Company Gremlin Graphics Software Ltd.
7.20 points at 15 votes (rank 293). Grab your bathing trunks......In this sports game Gremlin serves a niche sport. We are talking abouter water polo. The CPU opponent has 10 different difficulty grades. You play in 4 quarters with each 5 minutes of game time. However, each attack needs to be done within 35 seconds, or otherwise the ball possession goes to the opponent. As in any other team sport you can also make a foul. But after the 3rd foul by the same player he has to stay at the pool edge for 1 1/2 penalty minutes. 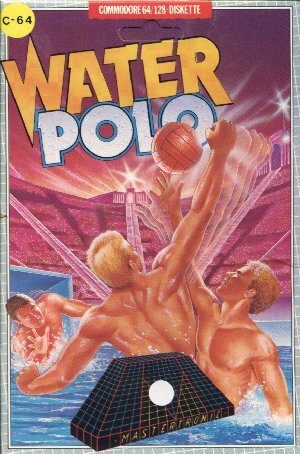 The graphics in water polo are good. The game area is designed clearly and the players are nicely animated. The player that is currently controlled is marked by a brighter bathing cap. Even the ball changes to a darker colour at the pool edge, by which it is good to recognize. The very frowny looking referee is always good for a laugh. Special attention has the Championship mode, where a tournament with 4 player can be absolved, which of course raises the "fun bar" even further. All in all is Water Polo in this area without competition. Despite the slightly sparse sound, it is a successful game which promises long time of fun especially in twos. 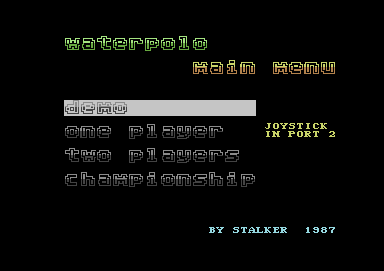 The rules mainly correspond the ones in real water polo. You can try to get possession of the ball by attacking from 5 different directions from the front. If the opponent is not active (i.e. does not wave the ball in the air), then the possession changes. An attack from the three rear positions (lleft rear, rear and right rear) is not allowed. A try is instantly punished by the referee with a foul. Fouls, goals and quarterly breaks are indicated by a whistle from the referee. An attack on the goalkeeper in front of the goal is also a breach of the rules. The fouls are personally counted seperately for each team member. After the 3rd foul a player gets a sending off (for 1,5 minutes or until the opposing team scores a goal) and the ball possession goes to the other team. Re-entering is only possible after a goals is scored or the ball has landed on a dry place or at the end of a quarter (ie. in situations, when both teams are not active). A quarter lasts 5 minutes, the allowed time for an attack is 35 seconds, if this time passes without a throw on the opposing goal the ball possession changes. When a goal is scored there is an instant action replay. This option is selected by default, i.e. if you do nothing the demo mode will be chosen automatically after 30 seconds. To choose the demo option press the FIRE BUTTON before the 30 seconds have run out. If the demo mode is selected you can choose the difficulty grade for both teams (from 0 - 9, whereby 0 is the weakest difficulty grade). Here the difficulty grade can be chosen. The human player controls the team with the black caps (joystick in port 2). 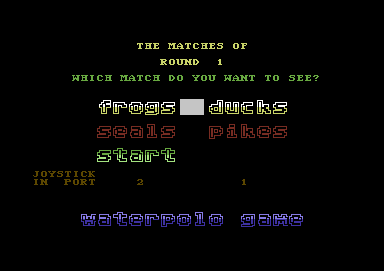 Blue team: joystick port 1, red team: joystick port 2. The programme allows 4 teams to compete in a championship. First, the difficulty grade is set, then you can change each of the names (in the championship table) to another (up to 5 characters). By renaming a team, you define the team as an own i.e. the one controlled by a human. To start the game, press the EXIT field in the table. You always control the player that is closest to the ball. You also call him the "activated" player and he is easy to recognize from the conspicious cap. As long as he is on the move, you can control him no matter how far he goes away from the ball. But if you stop him, the programme calculates the distance of each player from the ball and activates the nearest. At the beginning of each quarter there is to so-called swimoff, whereby the ball goes to the player that has first the finger on the FIRE BUTTON! If the activated player has no ball possession he follows the joystick movement, i.e turning and swimming into the corresponding direction. Joystick sideways (in relation to throwing direction): give the ball a spin in the given direction. This causes a bent fire line, whose exact course depends on how long you leave the joystick in this position. For a combination of power and spin you need to use diagonal positions. Let go of FIRE BUTTON and press again instantly. The player then throws the ball according to the description above. The progamm provides for the automatic activation of the goalkeeper if the situation requires it. Basically he is controlled in the same way as the other members of the team with one exception: if the ball is not within the goalkeeper's reach one can make him put up his hands and plunge towards the ball by pressing the FIRE BUTTON. RUN/STOP pauses the game. Another press on the same key or on the FIRE BUTTON continues the game. A small tip: make as many passes as possible and attack fast. And do not forget to press the fire button twice to throw! H.T.W: "An entertaining sports game with an unusual sport which stands out with good animations and very well implemented game rules. It is also very good, that there is a 2-player mode (2 players against each other) and also a computer opponent, whose strength can be adjusted in a big range. The only weak point is the sparse sound. A game which promisses much fun, especially with 2 players". This page was last modified on 29 November 2014, at 22:21.